I love Pinot Blanc wines – they taste great and compliment all sorts of dishes – from pork to chicken, fish and pasta – with their great fruit and acidity. Many will argue though that because Pinot Blanc isn’t a ‘noble’ grape, one shouldn’t spend too much time on it. It’s not an easily manipulated grape like Chardonnay (the ‘Winemaker’s grape’), doesn’t have the curmudgeonly, challenging-to-grow reputation of Pinot Noir, nor does it appear virtually everywhere with watery and boring regularity as does Pinot Gris. But as more than a few wine writers have argued (and you can count me in this group), this is a grape that should be named as the Okanagan’s white grape. Others disagree, but I really think Pinot Blanc is the epitome of Okanagan fruit and flavour. As long as it’s not a fat or flabby version (aim for one with acidity), it virtually screams, ‘I’m from the Okanagan. Love me,” from the glass. So, love it, you must and don’t overthink it; it won’t be overly complex, but it will enhance your dinner plate and shouldn’t break your bank. On the eyes, this version is pale gold with aromas of ripe stone fruit, lemon verbena and a base of crushed rocks. The palate is dry with juicy acidity and flavours of sweet, yellow pears, ripe peach, green tea and lemon grass. Delicious, refreshing and clean. I paired it with salmon, fresh roasted veggies and spinach pasta mixed with feta, parmesan, pesto and tomatoes for those at the dinner table who aren’t partial to reds. 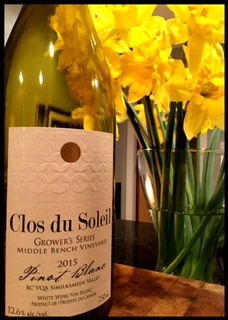 This entry was posted in British Columbia, Pinot Blanc, WHITE and tagged 2015, BC, biodynamic, Canada, Clos du Soleil, okanagan, Pinot Blanc, Similkameen, white wine. Bookmark the permalink.